I had just read Long Zheng’s blog about Interactive Office 2007 advertising on MSN when I stumbled across a Nissan advertisment in Windows Live Maps. 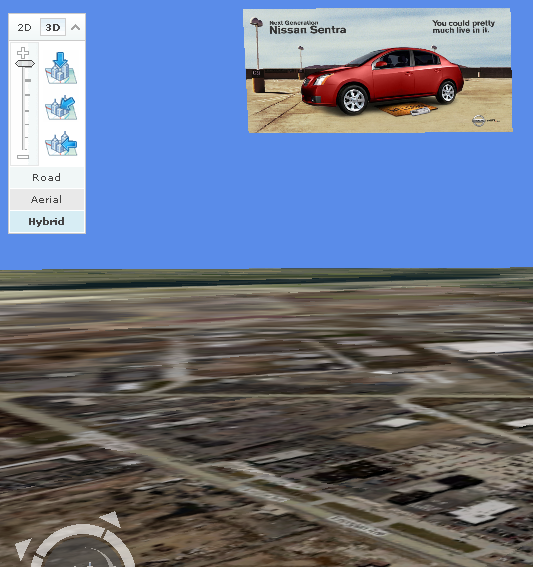 The billboard in the map links directly to the 2007 Nissan Sentra site which is pretty cool and quite surprising since I wasn’t aware of Microsoft adCenter allowing clients to advertise directly on Windows Live Maps. The Virtual Earth/ Live Maps blog has discussed advertising from the sky and how oblique imagery lets you peek at the rooftop, billboard and roadside advertising but hasn’t mentioned anything related to advertising on the site. Either way, a lot of nice stuff has started showing up on various Live properties and is slowly paving way for what will hopefully be an exciting Mix 2007. University of Pennsylvania Selects Windows Live Mail over GMail? The University of Pennsylvania has partnered with Microsoft to enhance the communications platform it offers to many of its students. Beginning in the fall semester, students in the School of Arts and Sciences and the Wharton School will have the option of using a customized version of Windows Live called Penn Live to access e-mail and a full suite of online communications services. Penn Live will host student e-mail accounts, including support for both mobile and offline access. The arrangement with Microsoft will provide students with 2 gigabytes of storage space. 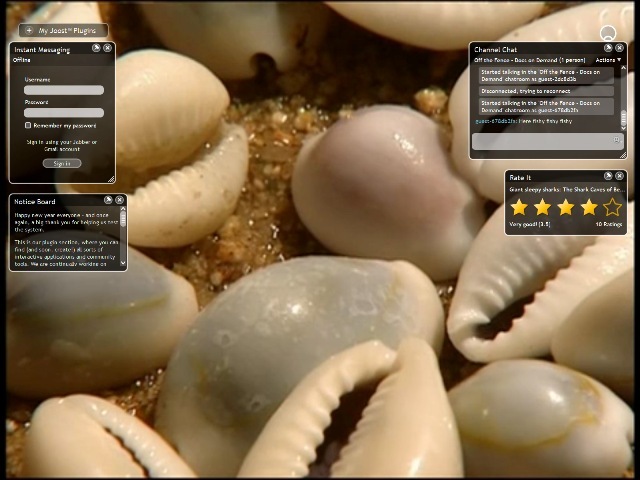 Other features include calendaring and contact management; Windows Live Messenger instant messaging and file sharing; Windows Live Spaces for personal web publishing, blogging and photo sharing; and FolderShare, a private peer-to-peer network that allows users to synchronize files between multiple devices and share files with other student users. Obviously I’m adding spice to the news release, but what immediately jumps to mind is did UPenn just select Windows Live Mail over Gmail when Google has just been pushing out features and improvements to their existing offering. Google Docs will soon have a presentation component, the integration of Google Talk within the mail interface and having POP access to all your mail are just some small but very nice features. One can’t even start to sing praises of the use of labels for organization of mail and the excellent calendar component. Yet with all these features, a committee of students and administration selected Windows Live Mail over Gmail. Impressive! Good job Microsoft and especially with the Ivy League win. The other part of the press release also gives you some insight on what to expect from Microsoft in the next few months – the relaunch of FolderShare or Windows Live Drive? The program called ColorPix will let you grab the color values and screen coordinates of any pixel on your screen. Furthermore, it automatically translates any screen color into RGB, HEX, HSB and CMYK color values, allows you to lock a specific pixel color, magnifies screen areas incase you want to get as close to the pixel as possible and also minimizes to the system tray for quick access. There’s nothing to install as it’s a self contained application and is completely free for use. If you’re interested you can download the program from Color Schemer. As announced on the Joost blog the latest version of Joost has just been released for testing. Joost was founded by Niklas Zennström and Janus Friis , a Swedish and Danish entrepreneur who co-founded the KaZaA peer-to-peer file sharing network and Skype peer-to-peer internet telephony network. 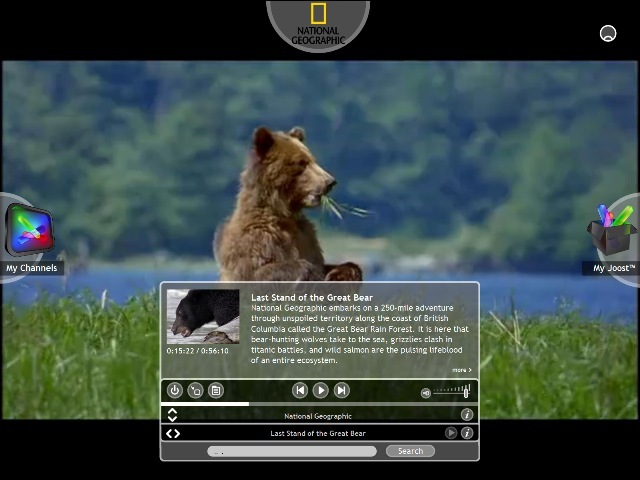 Joost is the peer-to-peer video distribution service. The standard marketing message on the Joost website is that Joost is a new way of watching TV on the internet. 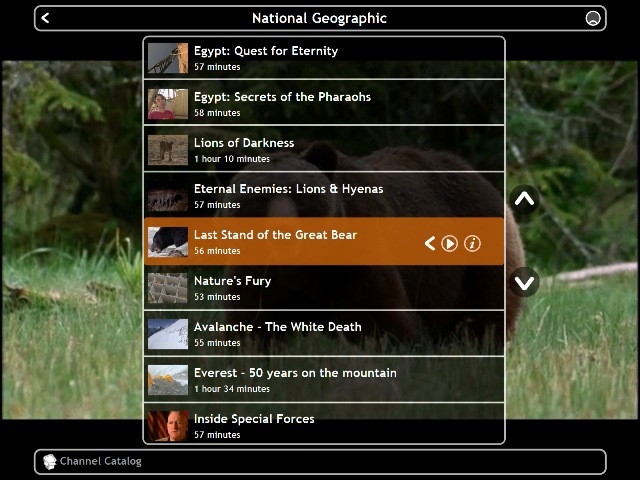 With Joost, you get all the things you love about TV, including a high-quality full-screen picture, hundreds of full-length shows and easy channel-flipping. Marketing aside, overall my first user experience has been impressive and the quality of the stream similar to the first Skype conversation I had; good but definitely plenty of room for improvement. As any product released today, the expected social community is built in with the ability to chat, rate shows, invite friends to view a show and some extras like the news ticker. As you may be able to tell from the screenshots below, a lot of work has been put in to ensure that Joost appeals to a wide user base. 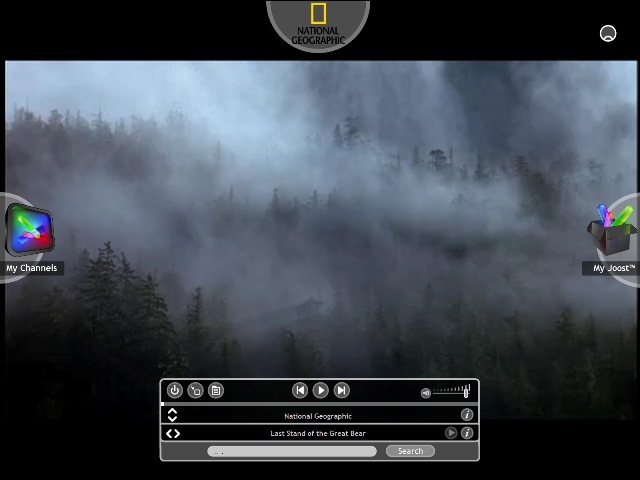 The current channel lineup is limited based on your geographical location but includes Alliance Atlantis Sci-Fi, Atlantic Street, BET, Beyond the Pit, Bite TV, BoomChicago, Braindead, Bridezillas, Channel Frederator, Chat the Planet, Classica Channel, Comedy Central, Critical Shorts, DR, Explora Channel, Fabchannel Concerts, Fifth Gear Shortcuts, Fight Network, Floating Worlds, GameStar TV, GONG Europe, Guinness World Records TV, Havoc Action Sports TV, Havoc Music TV, Healthination, Hot & Wet, i-concerts, IndieFlix Premier Hits, IndyCar Series, Intimate & Interactive, Joost Suggests, Jump TV Arabia, Jump TV Latino, Lassie, Lazy TV, Life on Terra, Lime, Live @ Much, Logo, LXTV, Ministry of Sound Access, Ministry of Sound Music Videos, MTV, MTV Benelux, MTV Nordic, MTV Staying Alive, Much Does Wakestock, MuchAdrenaline, MuchMusic Video Awards, MuchNews Weekly, MuchOnDemand, Music Is My Life, Music Nation, Nardwuar, National Geographic, Nettwerk, New Atlantis, Ren and Stimpy, Off the Fence Docs, OnSet, PokerHeaven TV, Rehearsals.com, Saavn, Saturday Morning TV, SecondsOut.tv, The Circus Channel, The Diddy Channel, The Hobby Channel, The New Music, The Recipe Channel, The Roger Sisters, The Soccer Channel, The Trance Channel, VH1, Virgin Fest 2006, VOY TV, Warner Bros. Records, Whereitsat.tv, WildLight, Witness, World Poker Tour, World’s Strongest Man, XL Recordings Channel, What’s Popular. Looking at the future plans for Joost expect to see a lot more add-ins being developed around the program. For now, I’ve tried it out and am happy with the initial release. If anyone cares for an invitation to test out the service drop me a line or comment.